The map quiz is a favorite learning tool for teachers of geography, social studies, and history. The purpose of a map quiz is to help students learn the names, physical features, and traits of places around the world. However, many students make the mistake of trying to study by reading a map over and over, merely looking at the features, mountains, and place names that are already provided. This is not a good way to study. Studies show that (for most people) the brain does not retain information very well if they only observe facts and images that are presented. Instead, students should find a way to pretest themselves repeatedly while tapping into their favored learning styles. The most effective way to learn any new material is by repeating some form of fill-in-the-blank testing. In other words, as always, students must get active to really study effectively. It's most beneficial to study a map for a short period, and then find a way to self-test a few times—by inserting the names and/or objects (like rivers, mountain ranges, states, or countries)—until it's easy to fill out an entire blank map. Chose from the tips below to find the best method to help students (or yourself) memorize a map or maps and prepare for a map quiz, or combine them and use several methods, ranging from old-fashioned flash cards and puzzles to electronic-assisted studying. Study a completed map first. Then print out five blank outline maps and label the countries one at a time. Color in the shape of the countries with the appropriate color as you label each country. After a while, the colors (which are easy to associate with a country from the first letter) are imprinted in the brain in the shape of each country. As DIY Maps shows, you can also do this just as easily with a U.S. map. First, read over and study a detailed map. Then place your blank outline map in the sheet protector. You now have a ready-made dry-erase map. Write in the names and erase them over and over with a paper towel. You can actually use the dry-erase method to practice for any fill-in test. As an alternative to the steps in the previous section, use a wall map, such as a wall map of the U.S., that is already complete. Tape two to four plastic sheet protectors over the map and trace the outline of the states. Remove the sheet protectors and fill in the states. You can use the wall map for reference as you study. In short order, you'll be able to fill in the names of the states, countries, mountain ranges, rivers, or whatever you are studying for your map quiz. Yet another alternative for studying a map of the U.S. (or Europe, Asia, or any of the continents, countries, or regions throughout the world) is to use a blank map. For example, blank—and free—U.S. maps such as those provided by the website Tools for Geologists show just the outline of the states, or the outline of the states with each state capital filled in. For this exercise, print enough blank maps to study. Fill in all 50 states, then review your work. If you find you've made a few mistakes, try again with another blank map. To study other countries or regions, use the free blank printables of Canada, Europe, Mexico, and other countries and regions provided in section No. 2 above. World maps showing these and other features are readily available online. Print a simple world map showing the features you need, then study it using the same methods as described in previous sections, but instead of filling out states, fill in the map according to national or state boundaries, topography, climate, or economic regions. For this type of map pretest, you may find a blank world map helpful, such as one provided by TeacherVision, a free teacher-resources website. Use free online tools to create your own map of a state, a country, a region, or even the entire world. Websites such as Scribble Maps provide blank maps, which you use as your canvas. 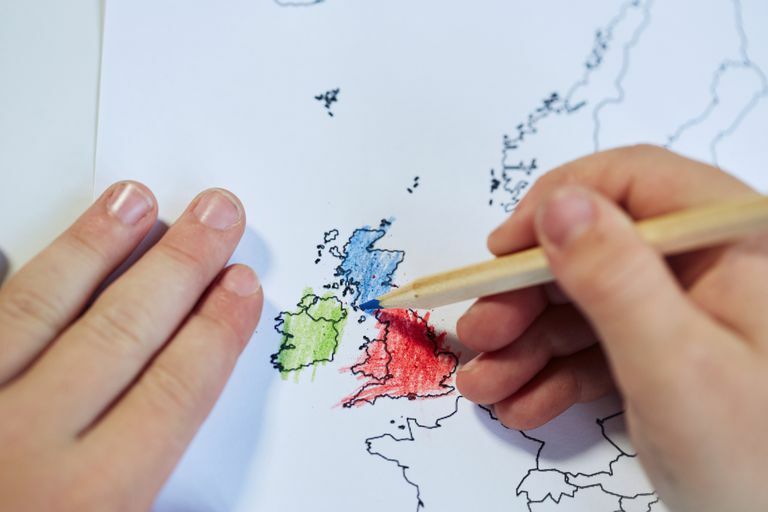 You can add national borders, or rivers, outline mountain ranges or countries, using virtual pens, pencils, or paintbrushes. You can even chose and change colors of your outlines or fill in entire political, topographical, climate, or other regions. There are literally hundreds of map apps available for smartphones and iPhones. (You can also find and download these apps on computer tablets and PCs.) For example, Qbis Studio offers a free world map quiz app that allows you to fill in the countries of the world on a virtual map. Andrey Solovyev, available free from Google Play or the iTunes App Store, provides an online 50 U.S. states map, which includes capitals and flags, as well as a virtual map quiz. The app also offers a similar quiz for a world map that allows you to take practice virtual quizzes to test your global map knowledge. Extend your electronic-assisted studying by using other free websites, such as Jet Punk, which provides scores of blank, virtual maps. For example, you can fill in the map of Europe by correctly guessing each highlighted country. The site provides the names of the European countries—from Albania to Vatican City—for you to select. You fill in the map of Europe by correctly guessing each highlighted country by clicking on the correct country name—the site highlights each country as you make your guesses. Hurry though; the website gives you only five minutes to pick all of Europe's 43 nations. A virtual scoreboard lets you track your progress. Of course, you can always choose to study the old-fashioned way: Grab a friend or classmate and take turns quizzing each other on the states, regions, nations, topography, or climate zones you are required to study. Use one of the maps you created in the previous sections as the basis for your pretest. Create flash cards of the states, for example, or download them for free. Then mix up the cards before you test your partner on the states, countries, regions, or whatever map parts you need to learn. Other similar map puzzles announce the state name or capital when you place the correct puzzle piece in the correct space. Similar world map puzzles offer maps of the globe with magnetic pieces of various countries and regions that hard-studying students can place in the correct spots as they prepare to ace their upcoming map quiz.